Marshall came to see me just two days after his first birthday! Do you remember his baby pictures? 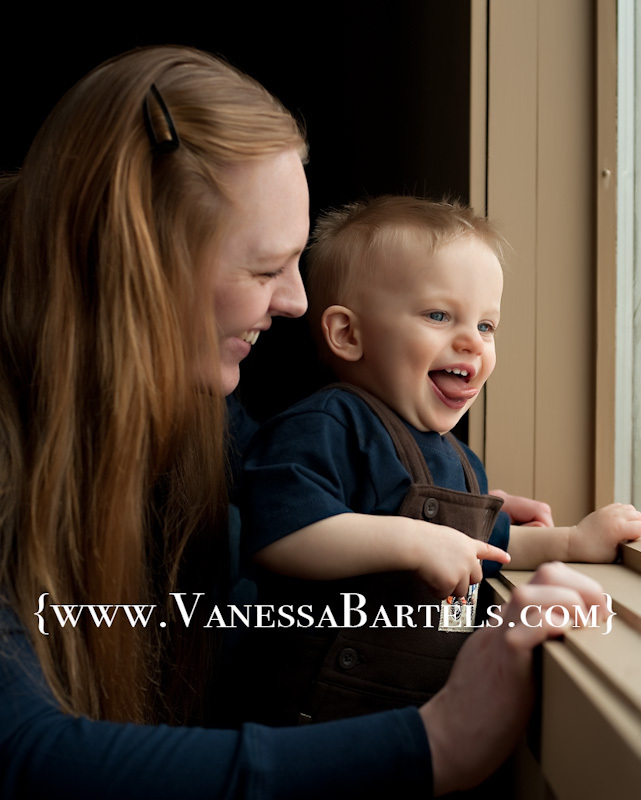 …and his Mom looking out the window! Of all the blue in this image I like those eyes the best! Thanks for coming to see me, Marshall! The centerpiece is a tree branch full of bottle cap necklaces that my sister Sarah makes. I asked her to bring them to the studio for the open house. They are so much fun! The outside of the studio is not quite finished. When it melts outside we are planning on building a porch on the front. The man in this picture lived on our place many years growing up. It was a delight to hear some of his stories. He remembers when this barn was built…in the 1940s. Actually, that man’s granddaughter is our dearly beloved summer babysitter Emily. And…I will be photographing another one of his granddaughter’s (Emily’s sister’s) wedding this summer! I am blessed! Have a great week and please stay tuned to the blog as I continue to catch up on last summer and fall’s sessions! I am so excited to have won something! Thanks Vanessa and your building looks GREAT! I am having a Matilda Jane trunk show next Thursday, March 11! I first saw this line of little girls’ clothing a few years back and have been a fan since. The clothes photograph so well and I thought it would be fun to have a trunk show and stock the studio with a few pieces that could be used by little girls that come here to be photographed! Actually, they have womens clothing and a few boys t shirts too…so only the men are left out! Their new spring line consists of adorable, mostly brightly colored pieces that mix and match and layer well together. You can view images of the spring “Hammond Bay” line on the Matilda Jane Blog. I will have samples of all the pieces in the new line at the studio March 11 from 5-8pm. There will be goodies to eat and I would love to have you stop by. While you are here you can check out the new studio that is finally almost finished!! If you can’t make it on Thursday, I will still have the clothing here on Friday and Saturday between 10am and 3pm. Also, if you are not tempted to check out Matilda Jane, but WOULD like to see how the studio turned out, just stop by Friday or Saturday between 10am-3pm. I would love to show you around. If you need directions, please contact me. Just in case you don’t know, my new studio is in the RED BARN on our property! When I planned this trunk show I had no idea the ground would still be covered with a couple feet of snow, preventing people from parking on the grass, so if you can, ride with a friend, and wear your rain boots since it will likely be slushy and a bit muddy! I have been planning a few door prizes and I think I will have to award one to the person with the most unusual or fun rain boots! I will leave you with a picture of Elsie in a Matilda Jane! Miss Violet and her brothers! I think this image is in the running for sweetest smile of all time! Actually, I think it was all those things put together! I got your message Mary and will be in touch about photographing your family this summer! Can’t wait! !